Firstly I have another little 'giveaway', but this one is probably only suited to those of you who are handy with a needle and thread. 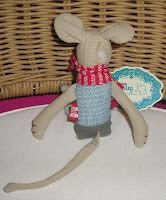 I have a poorly Maileg mouse - he is just a wee thing and is having problems with his neck. More specifically some stitching has come undone and I decided rather than going through the palava of making a claim with Maileg I would just give him away to someone who could make him better and offer him a new home. So if you would like to adopt a poorly mouse just leave a comment and I will pull names out of something next week. I also wanted to write about a lovely customer - Tracey in Australia. Hello Tracey if you are reading! Tracey bought the oh-so-lovely large Lola rabbit and very kindly sent me some photos of her in her new home on the other side of the world. 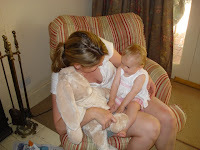 I love this picture of Tracey, her daughter Elizabeth and Lola bunny. Elizabeth had her first birthday a couple of weeks ago and Lola was a special present along with this gorgeous red wicker chair. Doesn't Tracey have a lovely looking home? 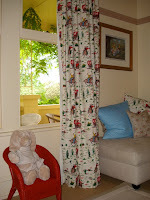 (Are those Cath Kidston curtains I spy?!) And of course it is all hot and summery in Australia at the moment - when Tracey and I were emailing the other day I was complaining about the rain and the mud (remember that post? It's getting worse!) and Tracey was complaining about the heat and the snakes and crispy dried grass. Hmmm... hard to decide which is better / worse really. Anyway, don't forget about the little mouse on offer - if you think you can heal him! Hi I'm no good with thread but wanted to say one of the other bloggers gives her hens porridge so I tried ! It took a couple of attempts to get them to eat it. I tried spaghetti too but they didn't want that ! I am a cat & a dog person infact love most animals ! The kidz had bunnies - dwarf lop very sweet & soft . Hello my dear, I would love to give the mouse a new home …so cute!!! It must be lovely too receive a picture from someone that has brought from you and what a cute picture it is. As for the hearts me and my mum made them…it was some fabric that she had left over from a job she did. I will ask her what fabric it was and let you know. 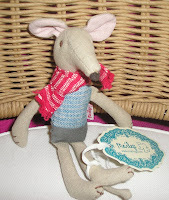 Your wee mouse is adorable..I really see he needs some TLC...I would love to enter your giveaway. I have 3 girls that would give him just the kinda of love he needs. Thanks for visiting me! Your friend might have to wait a while for eggs as the battery hens will need to recover their health - poor things . My feather was from a swan but I have got white hen ones - no black or brown yet. My daughter has just got in from college & I couldn't wait to show her the first eggs ! 'Oh' bless his little cotton socks 'or' tails maybe that should be. 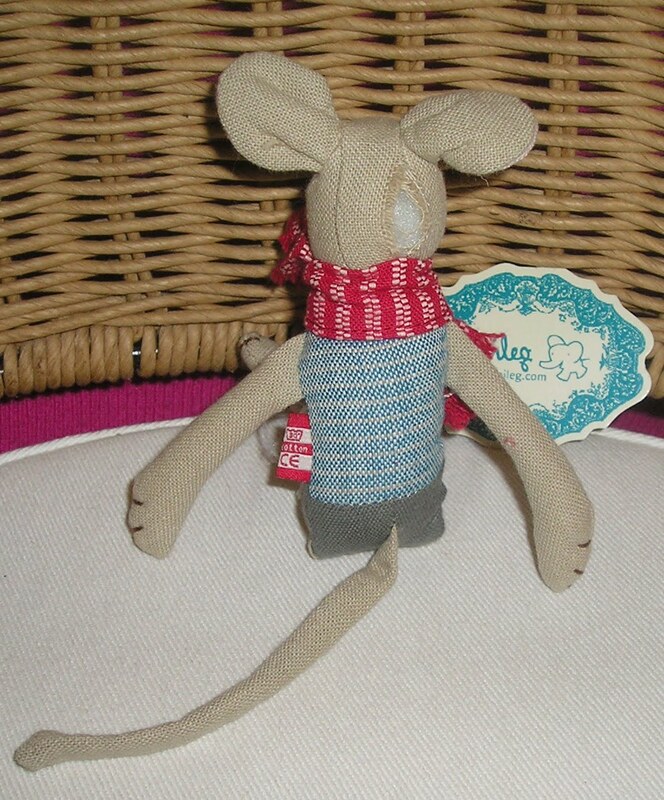 It reminds me of Bagpuss when all the items would get mended by the mice and now this little fellow could do with some stitchery TLC. Oh the poor little mouse! I'd love the chance to mend him. I make teddy bears so am quite used to hand sewing body parts back together! 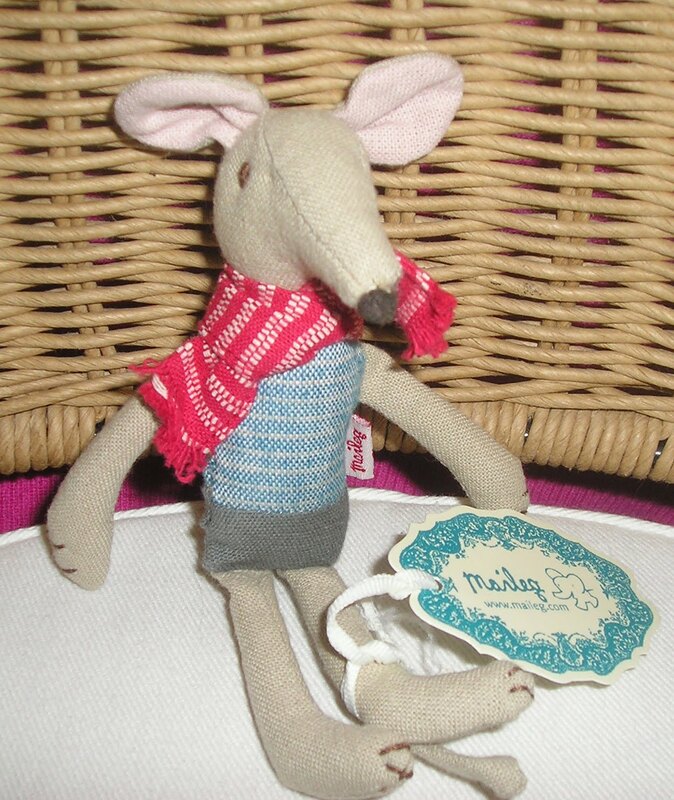 And we have a Moulin Roty Nini mouse here who I'm sure would be most welcoming to him!! We could help out that poor little mouse, and I have a princess who would care for him very well! A lovely giveaway, and lovely to discover you via Simply H.
awww he is adorable - and because he is poorly it makes me want him more!!!! Hope I and my 3 kids are lucky! Hello, I would love to enter your draw. What a cute little mouse and I would love to give it a new home. Lovely blog, I'm calling back to have another browse.